Ever wonder how food is prepared by Ilocanos from Cagayan Valley? 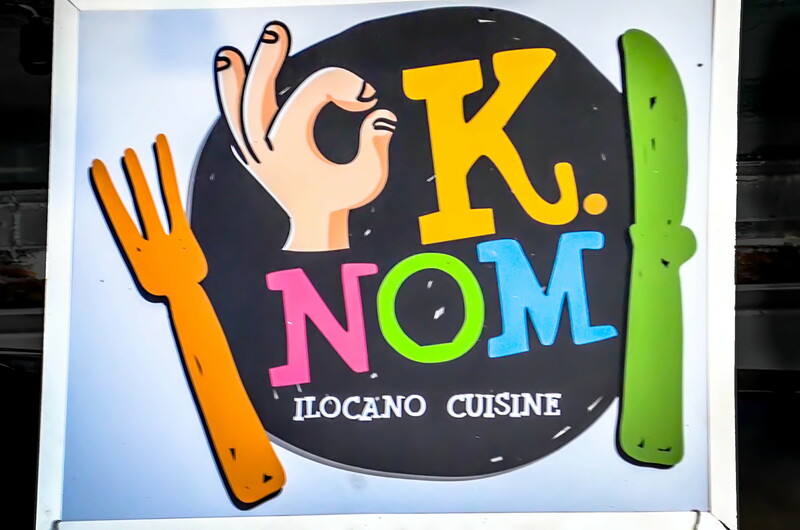 OK.NOM serves the best of both worlds, so you can expect scrumptious dishes popular in Ilocos and Cagayan Valley. Just like Pancit Batil Patung. A well-loved dish in Cagayan Valley makes its way to Space Food Park through OK.NOM. This is made of noodles with sauteed meats and vegtables. A piece of egg is cracked on top and stirred in simmering beef stock served as sauce on the side and this looks like an egg drop soup. And of course the ever popular in all parts of the country, the crispy sisig. It’s made from parts of the pig’s head and liver with onions and chili. Composed of two parts: noodles with toppings, and the sauce which looks like an egg drop soup. Poached egg along with sauteed meats and vegetables are topped over the fresh miki noodles, while a piece of egg is cracked and stirred-in simmering beef stock and poured in a bowl. Both components should be present when eating this dish to experience optimal flavor. Deep fried chicken skin similar to Pork Cracklings, best when accompanied with beer. Read about Space Food Park and all their stalls, click here. Help keep this website free. Please share the article, like my Appetizing Adventure Facebook Page, and follow me @carloflorenzo on Instagram and Twitter. Read my online profile: www.CarloLorenzo.com. Thank you.